Hi, I'm Jay Marzella, WELCOME, to Parmer's Resort. July 1, 2008 was my ten year anniversary as owner of Parmerâ€™s Resort. Two floods, eight hurricanes, and two divorces laterâ€¦.there is still nowhere I would rather be. Please come share our little piece of paradise. Iâ€™d like to thank you for taking the time to look at our website. On the â€œVirtual Tourâ€ page, please be sure to click on all the little movie projectors to see the rooms. On the Property Map page, roll your cursor over each roomâ€™s name to see a complete description, off to the side. I hope that you will decide to give us a try. I PROMISE you will be glad you did! Our General Manager Sandy Sledge and her staff, led by Sharon Heinrich, are working harder than ever to make sure that your stay at Parmer's is everything you expect. We have added quite a few new features, but we have kept our â€œold keys charmâ€ . The waterfront is looking better that ever. We have resurfaced the docks at two of the marinas, installed new dock posts, constructed three new tiki huts, hung a bunch of hammocks and added several BBQ grills. The place looks GREAT! We have remodeled and updated many of our rooms. We now offer a large selection of rooms with king beds and lots of new furniture. I am especially excited to announce the addition of two new LUXURY suites. The Presidential Suite, by designer Joan Muench is 1500 square feet of heaven on the 2nd and 3rd floors of our main building. Two hot tubs, two 45 LCD TVs, 1000 thread count sheets , a gourmet kitchen, spiral staircase, and so much more. The Lagoon, by designer Babs Moffitt. A tropical cottage with two bedrooms, two King Size Beds, a full kitchen, rich leather, a waterfront dining room, a 45 LCD TV, and a huge deck overlooking a private lagoon with an awesome sunrise view to wake up to. Outside, youâ€™ll enjoy a private BBQ grill and picnic table. Please ask to see any of our luxury suites when you visit us. Thanks again for taking the time to check out our website. Whether you are looking for the perfect place for your family reunion, a company fishing tournament, a romantic getaway, or your fantasy waterfront wedding, you will be glad you chose Parmer's Resort. I PROMISE! Parmers Resort is a unique waterfront resort in the Florida Keys. Our tranquil accommodations include traditional rooms, one, two and three bedroom suites and our luxurious Presidential Suite. Located 1/2 mile off of US Hwy 1, in a residential setting, Parmer's offers motel rooms, efficiencies and one, two, and three bedroom suites. Some rooms can be adjoined to make two bedroom/two bath suites. Many offer fully-equipped kitchens, including all utensils, coffeemaker, microwave and more. All of our rooms are equipped with air conditioning, cable TV and porches or decks. Breakfast at Parmers Resort keys hotelEach of our moderately-priced accommodations are unique and comfortable. Our waterfront location features a crystal clear pool, 3 lighted boat basins and dockage. Weekly rates are available for those wanting an extended stay in paradise. Our complimentary continental breakfast includes breads, bagels, muffins, donuts, toast, fresh fruits, juices, coffee and teas from 7:30 to 10:00 am daily. Relax on our waterfront, watching fishermen come in with their catch. Enjoy our tropical gardens and swaying palm trees. Fish the nearby flats for tarpon or fish offshore in bluewater for sailfish, marlin and dolphin. 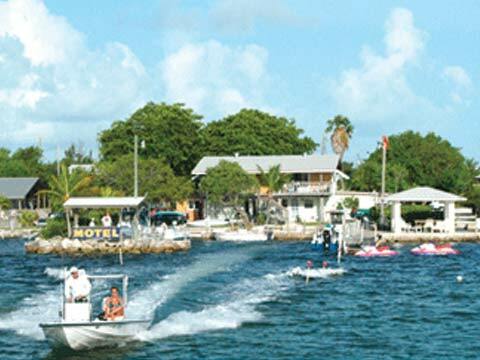 key west resortParmer's Resort is located 1/2 mile off US Hwy 1 on Little Torch Key, between Marathon and Key West. Spread over 5 acres of natural beauty, our waterfront location is close to Looe Key National Marine Sanctuary and the newest underwater attraction in the Keys, a 210-ft. sunken freighter, the Adolphus Busch Sr. We are near the Key Deer National Wildlife Refuge, Bahia Honda State Park and in the Great White Heron National Refuge. The perfect location for nature lovers, yet only 25 miles from Key West.